A pre-tested, secure earthing point with multiple connections holes, which simplifies both procurement and installation. ECFA ✔ - - Pre-cut earthing cable with connectors for earthing between metallic parts. ECFE ✔ - - Pre-cut earthing strap with pre-punched connection holes for earthing between metallic parts. 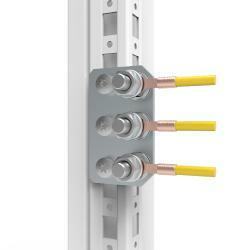 Provides earthing contact surface on horizontal or vertical frame profiles. For a secure earthing point with multiple connections. 3 central earthing points with mounting accessories. M8 earthing kit included for the three holes. Central earthing point for the frame of floor standing enclosures. The earthing point has been tested up to a short circuit of 40 kA, connecting different sections of the enclosure to a single point on the frame. The pre-tested earthing points ensure that both procurement and installation can be done efficiently.